2015 welcomed the Croser family back into the Tapanappa Winery and the Piccadilly Valley blessed us with a typical cool weather vintage of exemplary quality. The winter provided average rainfall and replenished the subsoil, but from August to December very dry conditions prevailed, The Tiers Vineyard receiving just 40% of normal rain. The three spring months and December were much warmer than average, only exceeded by the temperatures preceding vintage 2016 and vintage 2010. The warm dry conditions led to an early and perfect flowering and fruit-set in the Tiers Vineyard Chardonnay and a balanced crop of 8 tonnes/hectare. The Tiers Vineyard was planted in 1979 with the OF Chardonnay clone, a Californian derived clone with its roots in the mists of 19th century Mersault. This clone known as FPS 02A disappeared from California because it was suspected of carrying leaf roll virus, despite recognition of its superior winemaking characteristics. It doesn’t have leaf roll, we are lucky to have it and it is ideally suited to the distinguished site of The Tiers Vineyard. In 2015 the vintage conditions allowed it to show its best qualities. The cooler Eastern side of the Tiers Old Vineyard was hand harvested on the 17th of March two weeks earlier than average because of the warm early start to the season. The Tiers Old Chardonnay was hand harvested into shallow trays and cooled to 2C in the cold room at Tapanappa Winery, adjacent to the vineyard. The trays were tipped as whole bunches into the Willmes Merlin airbag press and the juice was gently extracted from the berries into a settling tank. After gravity settling the partially clarified juice and its fluffy lees were racked to French Vosges oak barriques, 33% new and the balance 1 and 2 use and allowed to ferment at the cool air temperature of the Piccadilly Valley autumn. The Tiers Chardonnay was left on full lees in barrique until the summer when it was clear racked and prepared for bottling in mid March. 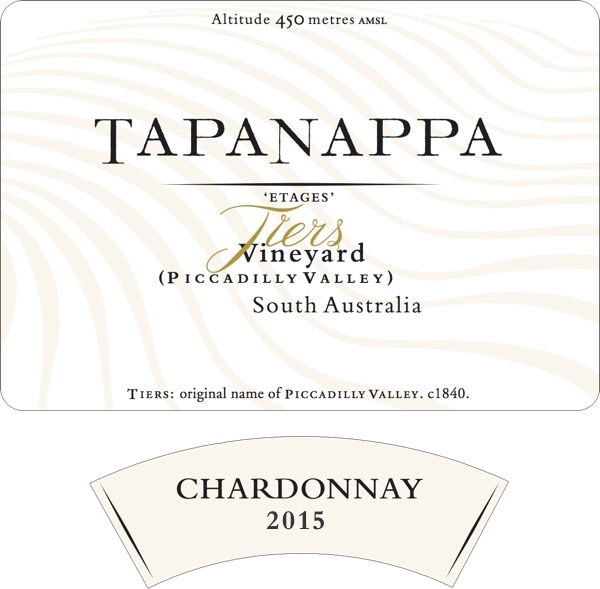 2015 Tapanappa Tiers Chardonnay was early ripening because of the warm spring but cooler than average during the late summer ripening season. The alcohol is moderate and the natural acid is elevated as a balance to the ripe stone fruit flavours of Chardonnay from The Tiers Vineyard. Bottled in March 2016. Only 180 dozen grown and made.